Remember Bon Cop, Bad Cop? It was that movie set between Ontario and Quebec where the characters spoke French half the time and English half the time. During the French sequences, English subtitles would adorn the bottom of the screen and vice versa. The movie has earned a bit of a cult following and is held up as this beautiful example of the complexity of Canada’s linguistic history. Whenever I have taught courses on the history of popular culture, invariably the movie comes up. One of the more interesting issues the film raises is the nature of the translation. Anyone who has ever used Google Translate knows how much meaning gets lost when things are translated literally word for word (like this). Because of this, the way in which we translate between languages is very important, particularly when the meaning can be easily misconstrued. In this episode of the History Slam I talk with Nicole Nolette, author of Jouer la traduction: Théâtre et hétérolinguisme au Canada francophone, winner of the 2016 Ann Saddlemyer Award for as the best book on Canadian theatre. 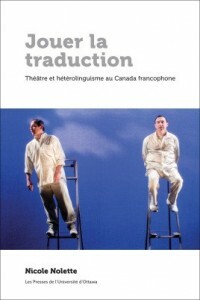 We talk about translating for theatre, the challenge of overcoming regional dialects, and the nature of bilingualism in Canada.